Further to the AUC pictures below, a pre-dating has occurred, at the Galaa club in Heliopolis, of 1957 and Ain Al Sokina in Suez, of 6 April 1967. More details to follow. 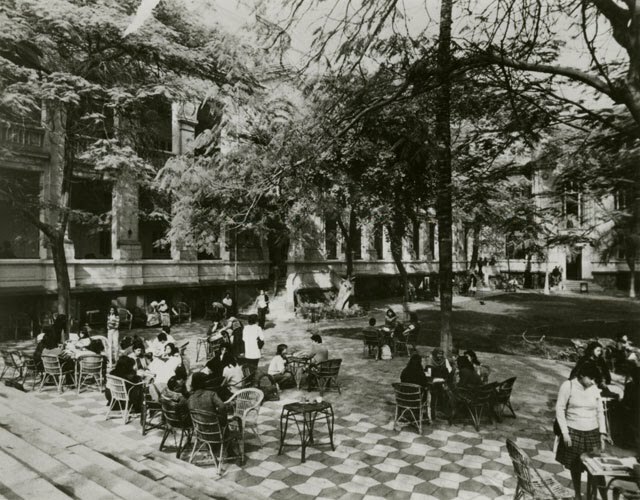 The AUC pictures are by far the earliest, and the more important, being clearly older than the other instances, these dating from ‘late 1960s’ and 1970s onwards. Also, I have now strong anecdotal evidence of 1966, at least, from Margaret Shabka, who studied at the AUC from 1966, and seemed to recall the pavings back then. Possibly, these may be even earlier; investigations are on-going. By far, the AUC pictures are the most significant, in both chronology and substance. The travel guide books are all of a much later period, of single instances, in the 1990s and 2000s and so are of less interest as to matters of chronology. Likely there are other ‘travel guide’ books where this situation has occurred, and if any reader would care to draw my attention to these I would be most grateful. The Old Cataract paving could be decidedly old, the exact age is open to speculation; possibly predating the AUC (the hotel opened in 1904). I contacted the hotel, but unfortunately they couldn’t find any picture in their archives. With thanks to Gregg De Young for archive detail, Steven Urgola and Nada Yassen of the archive for initial photographs, and Pam Garnett for a visit to the archive, and further photographs, and Margaret Shabka for her recollections. © Courtesy of the Rare Books and Special Collections Library and Archives, The American University in Cairo, Cairo, Egypt. This is possibly the oldest photograph; and indeed the clearest; observe the striking contrast between the tiles, appearing new. With thanks to Gregg De Young for archive detail, Steven Urgola and Nada Yassen of the archive for initial photographs, and Pam Garnett for a visit to the archive and further photographs, and Margaret Shabka for her recollections concerning the paving. Created 4 July 2012. Updated 14 December 2012, with Margaret Shabka account.